The NSH Series Couplings are constructed out of polypropylene and come with a non-spill design to protect users from chemicals and fumes. These couplings are economically priced, general purpose versions of the Colder ChemQuik CQG06 couplings. 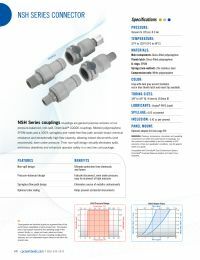 NSH Series couplings are resistant to a broad range of chemicals, provide a high flow capacity, and allow for a instant disconnections and reconnections, even under pressure. NOTE: This specialty item from Colder has a minimum quantity order of 25 fittings.